Although Iris West now knows about Barry Allen’s feelings towards her, those kids won’t be getting together right away on The Flash. It’s already been announced that Barry’s new love interest in Season 2 will be Joe West’s new partner Patty Spivot, and if that wasn’t enough romantic tension for you, the Scarlet Speedster’s other major flame from Season 1 will also be returning when The Flash’s sophomore season kicks off. And it could have some major effects. Linda Park will return as Iris West’s [Candice Patton] friend and colleague at Central Picture News and her past relationship with Barry will put both Iris and The Flash in unexpected danger. Barry and Linda met each other in the episode “Crazy for You” when he and Caitlin were at a karaoke bar. After going on several dates with him, Linda began to wonder if Barry still had feelings for Iris after learning about their history together, but Barry proved he wanted to be with her by eating a spicy pepper, which harkened back to a previous date when they ate spicy tacos. However, after he and Iris admitted their feelings for one another in “Out of Time,” he realized that he wasn’t meant to be with Linda. Once he traveled back in time to the previous day, he broke up with her in “Rogue Time,” though Linda was understanding that his heart ached for Iris rather than her. Because Linda and Iris work at the same publication, it’s no surprise that they’re still involved in each other’s lives to some degree. What’s most intriguing about Stanton’s statement is that Linda’s relationship with Barry will endanger not just Iris, but also Flash. 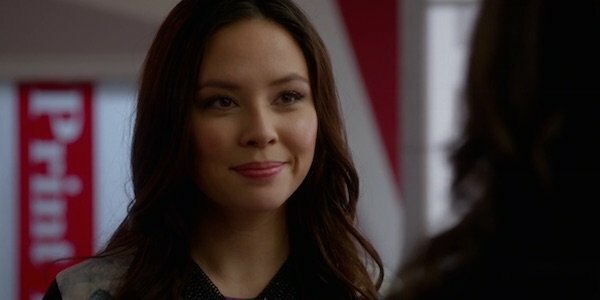 When she and Barry were together, Linda didn’t really get wrapped up in the shenanigans of Barry’s superhero life, so why people close to her would be targeted remain unclear. But Flash's involvement hints it’s a supervillain involved with all this. After all, a normal criminal wouldn’t pose a threat to the Scarlet Speedster. In the comics, Linda is the wife of Wally West, who started out as Barry’s sidekick Kid Flash and eventually inherited the Flash mantle. Wally will be played by Keiynan Lonsdale in The Flash, though it’s uncertain whether the two TV characters will be interacting, let alone starting up the same kind of relationship from the comics. But maybe that will have something to do with why it's Flash that gets involved and not merely Barry. The Flash Season 2 will premiere on Tuesday, October 6 on The CW.